Apostolic Revelation: Trinity The Mystery Or Mastery Over Deception? Trinity The Mystery Or Mastery Over Deception? Is Jesus And The Father Are The Same God, If Yes In What Way? Question : 'Trinity' (which relies on individualism thinking) while the Bible talks of Godhead (which is concentric - one within another). What does it mean when Jesus said, 'you do not know the Father because you do not know Me, if you had known Me you would have known the Father'? Does it not mean that Jesus was the Father in flesh revealing Himself to the world, i.e. the same God revealed to the world in the form of Jesus Christ. Catholics think Jesus was both God and man in the flesh and this understanding is carried even by many believing theologians. Mary was mother of a man Jesus and not of God, some Catholics say. How do we prove otherwise? Answer : Jesus the Christ our Lord is 100% God and 100% Man (1 Tim 2:5; John 8:58). There is no change in that and that is the Truth. God is three in person and one in essence. Yes we can explain the Trinity using the illustration of concentric circles, shield, three leaved Shamrock plant, sun, water, etc....but God is more than all these and cannot fit in fully with our illustrations no matter much we try and how many that come closely near to Him being described. Up to the level God has revealed it belongs to us as God's children, above that we cannot know for now but when we become like Jesus one day after we get transformed in to the very image of Jesus in our glorious body, we will come to understand the Trinity at least to grasp Him as we are know to the heavenly level of understanding (Deut 29:29; 1 John 3:2; 1 Cor 13:12). When Jesus said, "you do not know the Father because you do not know Me, if you had known Me you would have known the Father" (John 14:7, 9; 8:19; 16:3), it means he was not saying that both he and the Father are the same person, but rather he was emphasizing to the unbelievers that God the Father cannot be understood, know and experienced unless they believe His Son whom he had sent in to the world (John 8:42-43, 46-47, 55). In other words, Jesus was saying God can only be reached through believing Him, and without Jesus no one can come to the Father as it is the one and only route available which Father God has set for all those humans who wanted to experience God and do His will for their lives to be saved and continue in friendship with Him for eternity ahead (John 14:6; 3:17-21). The concept that Jesus was the Father in flesh revealing Himself to the world, i.e. the same God revealed to the world in the form of Jesus Christ is not true as we have seen in the above verse which says not about the sameness of the Godhead but rather the prescribed route of God which is through Jesus Christ the Son of God to reach the Godhead. We also need to consider that the three person of Godhead though they are ONE IN ESSENCE OF THEIR CHARACTER (Deut 6:4), yet clearly the Bible reveals that they are THREE IN PERSON AS INDIVIDUALS (1 John 5:7). We should keep both these attributes of God as mystery that cannot be understood by the finite mind. As long as we know God is God and We are humans who are of limited understanding to fully grasp the CREATOR OF THE ENTIRE UNIVERSE, we should wait for the time in eternity to understand this wonderful truth. And that too it will be revealed bit by bit in heaven, and even eternity will not be enough to make us fully understand this mystery of Trinity. I mean how God can be one in essence, yet three in person. All three are individuals and not emanations of one God. Accordingly, the whole work of creation and grace is seen as a single operation common to all three divine persons, in which each shows forth what is proper to him in the Trinity, so that all things are "from the Father", "through the Son" and "in the Holy Spirit". In other words, each person of Trinity have taken a responsibility in creation and salvation of humans to fulfill a certain aspect of the one project to fulfill equally what they have chosen to do. And through fulfilling their one desire, they have chosen to relate themselves to his creation in a unique way of revelation and yet remain the same in their desire, purpose and character of Divine essence which are the same in all three person. We know that the most influential verse in the New Testament about the revelation of Trinity, came from the mouth of Jesus Himself who mandated saying, " 18...“All authority has been given to Me in heaven and on earth. 19 Go therefore and make disciples of all the nations, baptizing them in the name of the Father and of the Son and of the Holy Spirit, 20 teaching them to observe all things that I have commanded you; and lo, I am with you always, even to the end of the age.” Amen." (Matt 28:18-20). We do not have one deity manifested in three separate aspects as some Oneness Pentecostalism wrongly believe. Nicene Creed described Christ as "God of God, Light of Light, very God of very God, begotten, not made, being of one substance with the Father", because a lot of heresies were gaining ground to destroy the true faith of the people of God in 325 .A.D. Also we know that the baptism of Jesus is the place where we see the manifestation of all three persons of the Trinity: "And when Jesus was baptized, he went up immediately from the water, and behold, the heavens were opened and he saw the spirit of God descending like a dove, and alighting on him; and lo, a voice from heaven, saying, 'This is my beloved Son, with whom I am well pleased.'" (Matt 3:16-17). Here in the above verses we see the three persons of the God-head separately as distinct person from each other. This is the Faith of our baptism that teaches us to believe in the Name of the Father, of the Son and of the Holy Spirit. According to this Faith there is one Godhead, Power, and Being of the Father, of the Son, and of the Holy Spirit. Those who place great emphasis on the baptisms in Acts like Oneness Pentecostals often question the authenticity of Matthew 28:19 in its present form, but they have not realized that the name of Jesus is the power of attorney which has been given to the believers to use the power of the name which is in the Father, the Son and the Holy Spirit (Php 2:9-11), which means both are the same, I mean when Matt 28:19 which has been described is used practically by a person it becomes the baptisms in Acts used by the apostles and other believers (Acts 2:38-39; 4:12, 18-19-20; 5:40, 42; 8:12, 15-16, 35, 37; 9:18; 11:16-17; 15:7-9; 16:31, 33; 19:5-6; 28:31). To illustrate it simply consider, A (The Father) +B (The Son) +C (The Holy Spirit) = D (Jesus Name), you can either use D while baptizing people as the apostles did in the Book of Acts or you can use A+B+C while baptizing people like Jesus explained in details in Matt 28:19. Both means the same and are the same. Great many confusions and divisions happened in the Church because of lack of understanding this one simple thing. Let us avoid silly things like these so that the bone of contention among Pentecostals may not stay to divide the Church further and cause disgrace to our Lord Jesus. Thus "Tri" meaning three, and "Unity" meaning one, Tri+Unity = Trinity. 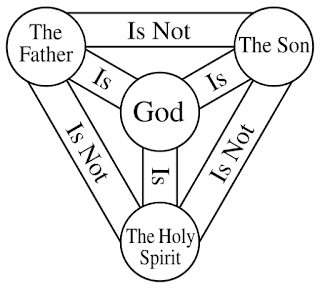 Included in the doctrine of the Trinity is a strict monotheism which is the teaching that there exists in all the universe a single being known as God who is self-existent and unchangeable (Isaiah 43:10, 44:6, 8). Yet at the same time, right from the Book of Genesis to Revelation we see God described as more than one in pluralism to denote the Father, Son and the Holy Spirit as three individual person and not the same God with three emanation. So we know that even though the word 'Trinity' is not in the Bible as it is a concept, actually Trinity was coined by the Church Fathers in the early centuries right after the apostles died in order to express the truth that God can be one, but still as revealed in the Word of God He is three in person at the same time. This standard of scale revealed by the Church Fathers through the word 'Trinity', kept the believers from being deceived by the heretics who acted as Christians yet internally they denied the deity and Lordship of Christ Jesus by saying that either Christ Jesus was created or is just a emanation of the Father God. For the same reason still in our generation we are using the word Trinity even though it is not in the Bible. So we must say that in the spirit within which was taken from heaven and put within the womb of Mary by the Holy Spirit was the Son of God who eternally existed with the Father (Isa 9:6; Luke 1:35), whose spirit was covered with human flesh and bones which together was called as the body which the Father had prepared beforehand for His Glory so that Jesus the Christ could come and do God's will for humanity to be saved from sin to receive the life of God by believing him (Heb 10:5-7; John 1:1, 14; Luke 24:36-37, 39; John 5:24; 1 John 3:14). The Roman Catholics are right in their belief of Trinity at least as they have held on to the doctrine of the early Church Fathers in this particular area as they deviate in to heresies in other areas such as salvation by works, transubstantiation, purgatory, etc... Jesus was both God and man in the flesh and this understanding is carried even by many believing theologians because the Bible perfectly and clearly supports it in every corner of the Bible. Mary was the mother of a man Jesus and not of God, but the person who was within Jesus body as a spirit was none other than God the Son Himself who left His Glory in heaven and humbled himself in to the hand of the Holy Spirit who kept him inside the human child body of Mary and he found Himself as man (John 17:5; Php 2:6, 7, 8). When Paul the aposlte says that, "Although He [i.e. Jesus] existed in the form of God," he is simply saying that Christ had the "form, appearance, look, existence or likeness" of God in that Christ had the divine nature or substance of God Himself. The above verse beyond doubt proves that Jesus Christ was both God and Man at the same time in one. So trinity is mystery and at the same time a mastery over deception that comes through deceivers, and the Father, Son and the Holy Spirit are all the same God in essence of their nature of existence, but three in their individual person-hood of their expression. Hallelujah!